Didiosky Benitez Erice: A methodology for knowledge management using Open Educational Resources in teaching-learning processes: the case of Central University “Marta Abreu” of Las Villas. Together with Paul Scott I gave a keynote titled: “Strategies & Policies for the implementation of Free & and Open Source Software in Higher Education Institutions”. 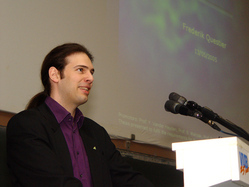 Paul Scott is head of the Free Software Unit in the University of Western Cape. He is also the lead developer from the (mainly African) e-learning environment Chisimba. We met each other before shortly, but now that Prof. Georges Eisendrath invited us to work together on this presentation, I had the real pleasure to spend a week with Paul. I consider Paul a highly skilled hacker (in the original sense ofcourse) with a heart for the “right” technologies.